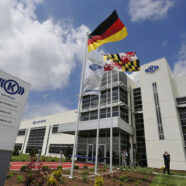 Knorr Brake is the American base of German-based Knorr-Bremse. It manufactures braking, door and HVAC systems for mass transit vehicles. After 18 years on Baltimore Boulevard, Knorr’s new $28 million, 235,000-square-foot facility is on Arthur Peck Drive, across Route 97 from the Carroll County Regional Airport.